This image was taken by the crew aboard the Kalapana Cultural Tours boat. Earlier today, a basketball-sized chunk of molten rock slammed into a tour boat off the coast of Hawaii, injuring 23 people and sending at least four to the hospital. 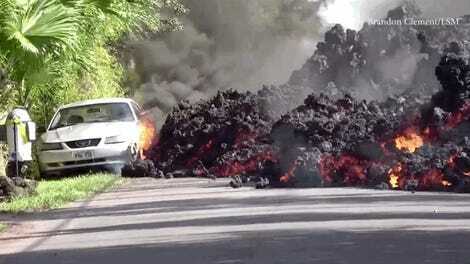 The incident happened near the Kilauea volcano, which has been erupting since early May. 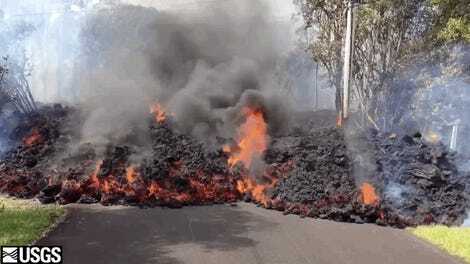 As USA Today reports, the Lava Ocean Tours boat was hit by falling lava caused by a littoral explosion near the Kapoho volcanic ocean entry, where molten rock from the Kilauea volcano is pouring into the sea. It’s not known how far the boat was from the ocean entry, but it was clearly close enough to sustain damage from falling debris. The incident happened around 6:00 am local time on Hawaii’s Big Island. The hole in the roof of the Lava Ocean Tours boat. 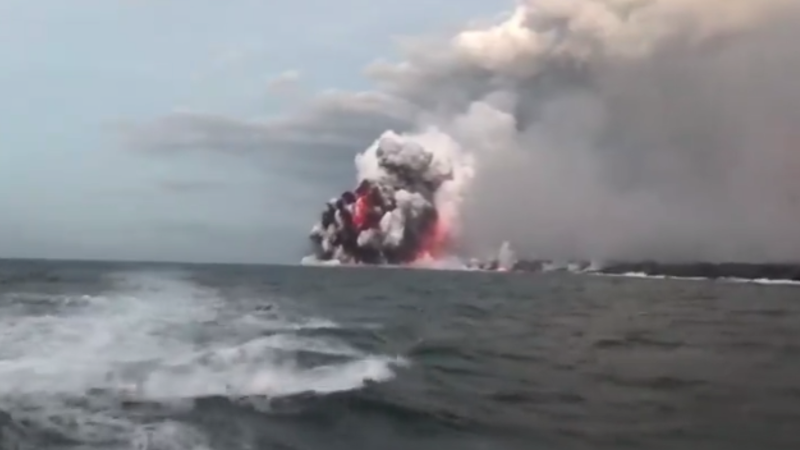 Today’s dramatic explosion, captured on video by a tourist on another nearby boat, threw molten rock into the air, including the basketball-sized lava bomb that pierced through the roof of the Lava Ocean Tours boat, creating a large hole. Debris from the explosion could be seen strewn along the floor of the vessel. Hot spot, indeed: Debris strewn on the floor of the boat. 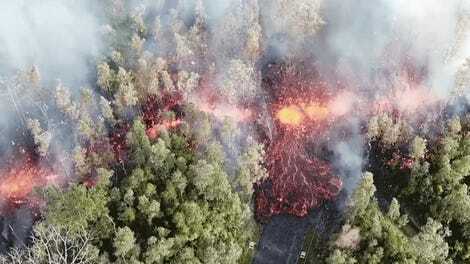 Eyewitnesses said the lava bomb landed on several people, injuring both passengers and crew members, according to Hawaii News Now reporter Mileka Lincoln. The boat managed to return to its base at the Wailoa Small Boat Harbor in Hilo, about an hour’s trip from the ocean entry point. The injured were sent to the Hilo Medical Center. A blurry shot of the littoral explosion. “Of the injured, four were taken by ambulance, one seriously injured with a fractured femur,” explained a Hawaii County official in a statement. “Most of the injured passengers had superficial injuries and were treated on arrival at Wailoa Harbor in Hilo.” The woman suffering the fractured femur is 20 years old, according to the Department of Land and Natural Resources. The minor injuries were described as soft tissue injuries and burns. 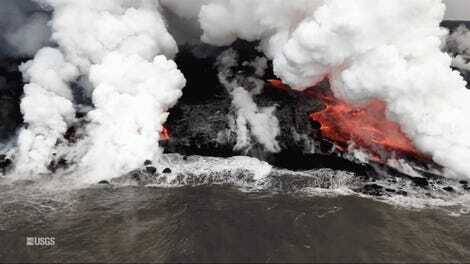 Littoral explosions happen when hot lava erupts on entry into cold seawater. 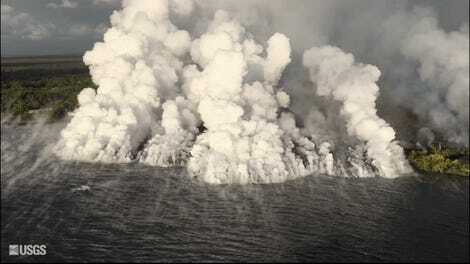 Today’s explosion was particularly large, catching the Lava Ocean Tours boat and other nearby craft off guard. In addition to lava bombs, the ocean entry point is also producing noxious gasses and dangerous shards of volcanic glass that can irritate lungs. Visiting the ocean entry site sounds exciting, but as today’s incident shows, it’s also very dangerous.